Scientists have captured the glowing debris ring of an asteroid torn apart by a dead star for the first time ever. In a breathtaking first, the Hubble Space Telescope has just captured a photo of an asteroid being torn to pieces by a dead star. Scientists at the University of Warwick in the UK captured the amazing image of the glowing rings that form when a star turns an asteroid into dust after it entered the graviational pull of the star, according to a Fox News report. The spectacular display is also due to the collisions of debris within the ring, which results in gas that is illuminated by the star’s ultraviolet rays, giving off an eerie red glow. 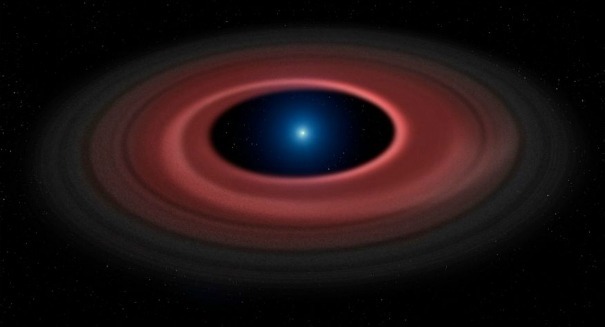 While scientists have long known about these debris disks around so-called “white dwarfs,” it’s the first time they’ve been able to snap a picture of such a disk. The debris disk is so big, it’s actually much larger than Saturn’s rings, spanning about 700,000 kilometers in diameter — about half hte size of the sun, and a span that could fit all of Saturn and its rings easily, as the planet is just 270,000 kilometers across when you count its rings. This white dwarf in particular is tiny in size but incredibly massive — it weighs 2,500 times more than our sun despite being seven times smaller. It is the result of a violent collapse and resulting supernova explosion that marked the end of its life.